This is a hub for iPhone jailbreak and unlocking software which includes step by step guides as well as guides on how to jailbreak your ipod and ipad. This can be a very lucrative business all you have to do is create a landing page where people can buy access to your iphone unlocking hub to unlock their iphone. There are people making thousands of dollars a month selling iphone unlocking software and you can too! 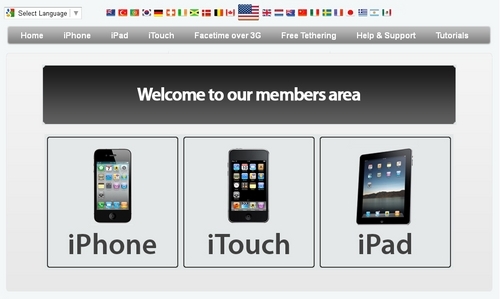 This provides you with the software and guides for every iphone, ipod and ipad you just have to create the landing page! The unlocking solution/guides are the most current out there and can unlock 2g iphones, 3g iphones, 3GS, and Iphone 4 iphones and jailbreak for Iphone 4S. They are an instant download so customers can download after buying. When new unlocks are released the hub will be updated and you will get the latest software available. You can create a fully automated business and all payments go straight to your PayPal account if you setup a landing page. You own the product your selling so you keep 100 of the revenue. This makes for a great starting business because all the earnings go directly to your PayPal account and you do not have to pay anyone else.